Ever since DC and Warner Bros. began production on the live-action Shazam! movie, it's been heavily speculated that the mystical hero could have a run-in with Henry Cavill's Superman. Earlier this year, new rumors circulated that it could be happening; then we heard that it the studio couldn't work out getting Henry Cavill into Shazam!, and it seemed like the final discussion on the matter. Now, however, comes a new report stating that "Superman" will appear in Shazam! - but Henry Cavill won't. "According to sources close to WGTC, the Man of Steel’s appearance comes at the end of Billy Batson’s new film as part of the payoff to a running joke. Throughout the movie, it’s said that Billy’s friend and foster brother Freddy Freeman has been asking Billy to show up at his school in the Shazam persona in order to prove to all of Freddy’s classmates that he knows the hero. In the final scene, Shazam finally shows up, before saying that he brought another friend with him. At this point, Superman walks into the room, but since Cavill isn’t looking ready to return anytime soon, the film will allegedly use a body double that doesn’t show Clark Kent’s face." At this point, it makes sense that DC/WB would reference the Superman franchise without bringing Cavill in. The situation with that character and casting has been extremely murky as of late; and now that Ben Affleck has dropped out of his Batman role, DC fans have been wondering if Cavill's Superman will be recast, as well. There were reports that Cavill's demands for his next Superman movie were stalling forward progress - a claim that Cavill's team has strongly denied. For now, it seems as though "Superman" will have to be admired at a distance, until the next step is decided for him. 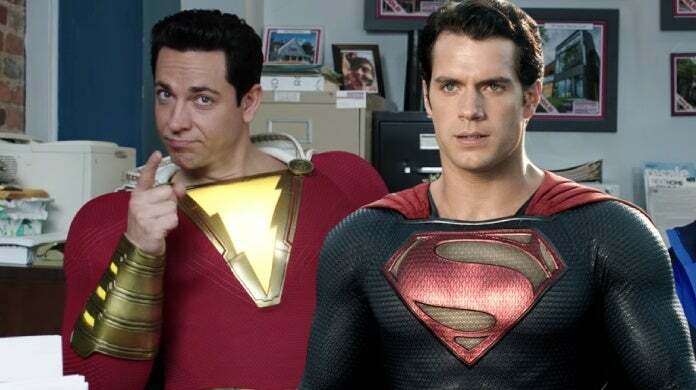 Other big DC Comics cameos seemingly confirmed for Shazam! recently include the possible first looks at the entire Shazam family, who are created when Billy Batson's (Asher Angel) foster siblings - Freddy (Jack Dylan Grazer), Mary (Grace Fulton), Darla (Faithe Herman), Eugene (Ian Chen) and Pedro (Jovan Armand) - all get endowed with mythical superhero power, as well. Be sure to check that out. The DC Movie Universe continues with Aquaman, in theaters now. Shazam hits theaters on April 5th, Joker on October 4th, Birds of Prey on February 7th, 2020, Wonder Woman 1984 on June 5th, 2020, and The Batman on June 25th, 2021.